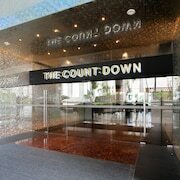 Situated near the airport, this luxury hotel is within a 15-minute walk of City of Dreams and Venetian Macao Casino. Cotai Strip is 1.1 mi (1.8 km) away. Situated near the airport, this luxury hotel is within a 15-minute walk of Venetian Macao Casino and City of Dreams. 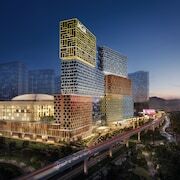 Cotai Strip is 1.1 mi (1.7 km) away. We booked the family room for 5. Space was enough but the sofa bed was a bit hard. Where to find Macau SAR hotels near an airport? Where can I find hotels in Macau SAR that are near tourist attractions? Macau is a world away from everything you know. Amazing temples, vivid outdoor markets, and mystical ruins rage together in this city of wonder. What will strike you first about Macau is how distinctly Mediterranean the local culture feels. The legacy left behind by Portugal’s colonization created an indelible mark on the art, cuisine, and customs of this portion of Asia. This dazzling spot on the Pearl River Delta is a major hub for gambling and entertainment. The glowing fountains, themed resorts, and live shows here rival anything found in Las Vegas. When you’re ready to hit a lucky streak in the Vegas of the East, find a winning hand of deals on Expedia.ca. 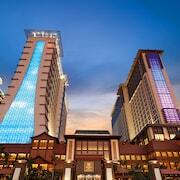 Booking cheap prices at Macau hotels with us is like hitting the jackpot a hundred times over. The globe’s rich and famous land here to party in the lap of luxury. Casinos are extravagant, cuisine is excellent, and the clientele lists at restaurants and nightclubs are exclusive. Of course, there’s always an opportunity to splash a little history and culture into your cocktail of fun in Macau. UNESCO World Heritage Sites are peppered throughout nearly every gilded block here. Local attractions definitely cater to Western tastes. Theme parks, laser shows, and zany museums offer a taste of American humor and European style with a Chinese twist. 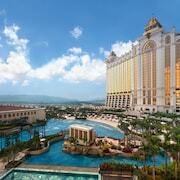 Macau’s casinos and resorts owe much of their popularity to the region’s pleasant weather. This gambling kingdom's average annual temperature is around 23 degrees Celsius. Summer is noticeably hotter and more humid than winter. Spring and fall offer periods of mildness between winter’s dry air and summer’s high moisture levels. Hotels in Macau thrive through every season and special holiday. Indulge in the ultimate escape whether you’re fleeing your region’s snowy weather or summer doldrums. Are you ready to transport to a golden wonderland containing the Wynn Performing Lake, Guia Fortress, and Lotus Square? Don't forget that Senado Square is the true heart of Macau. Explore cathedral ruins, historic municipal buildings, and vendors in this lively square. Satisfy your appetite while exploring Dasanba Street’s great shops, restaurants, and bakeries. Find your way to the Mandarin's House, A-Ma Temple, and Fortaleza do Monte. Cuteness lives at the Macau Giant Panda Pavilion. Casinos and entertainment venues will awaken your appetite for responsible fun when the moon rises every night. It’s so important to have a great Macau hotel to come home to when the fun tapers off in the wee hours of the morning. Luckily, Expedia has amazing discounts at boutique hotels near top casinos. People from all over the world are planning amazing vacations to Macau right now. Hurry to book the best discounts for your stay before they get snatched right out from under your nose. It’s easy to do once you know that Expedia offers you the guaranteed best rates on hotels and cheap flights to Macau. Let the exciting atmosphere in this world of ageless adages and modern temptations put a tingle down your spine. It's time to reserve your Macau hotel before the luck runs out on your chance to grab rare specials. 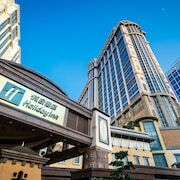 What are the most popular Macau SAR hotels? Are there hotels in other cities near Macau SAR? What other types of accommodations are available in Macau SAR? Explore Macau SAR with Expedia.ca’s Travel Guides to find the best flights, cars, holiday packages and more!